The Roman poet Virgil, who went to school in Cremona, in Lombardy, wrote many things that are plangent and true. “Wherever the fates lead us, let us follow,” he advised. “I fear the Greeks, even when they bring gifts,” he warned. “There’s a snake lurking in the grass,” he warned some more. It’s good stuff. And, if you want to live a fruitful life, you can do a lot worse than follow his pronouncements. But had I listened too carefully to Virgil when he said “Hug the shore, let others try the deep”, I would not have turned off the motorway between Milan and Venice, or headed down into the unfamiliar stretches of the Po Valley, or decided to stop in Cremona. And that would have been tragic. 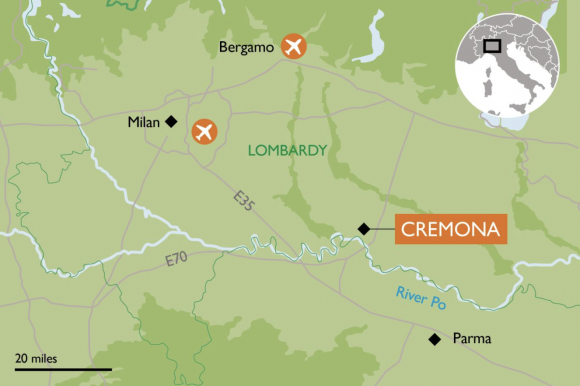 Music lovers will know Cremona best as the home town of Antonio Stradivari, and it’s fair to say that wherever you turn in the city, some part of his shadow falls across the vista. To the left and the right, there are traditional luthiers making violins and cellos: more luthiers than you can shake a bow at. And the violin museum, filled with priceless instruments, is a dizzying musical destination. I was half expecting Cremona to be full of Strad stuff. It was the other things on offer that surprised me. 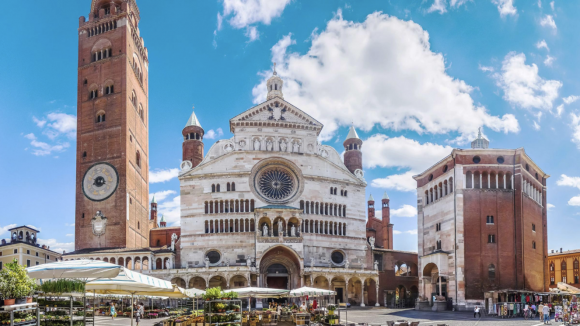 In particular, there was Cremona’s unusually beautiful historic centre, and the fine architectural goodies clustered around its central square. I have visited a lot of Italian squares. In my line of work — art critic of The Sunday Times — it’s an occupational must. Many are pleasing. But none is quite as perfectly pleasurable as the Piazza del Comune, in Cremona. Cathedral on one side. Tower next to cathedral. Perfect cobbles. Kids playing football. Tasty Cremonese food establishments ringing the perimeter. All in perfect harmony with each other. Damn it, Virgil said that “fortune favours the bold”, so I am going to be superbold and announce that, in my opinion, the medieval square of Cremona is the prettiest square in Italy. The tallest building on the square is the bell tower — the torrazzo — completed in 1309. At 370ft, it is the tallest brick structure in Italy. A third of the way up is a huge astronomical clock — the largest in the world — covered in zodiac signs. It was started in 1583, at the height of the Renaissance, and brought a smile to my face. The Renaissance is supposed to be a great period of enlightenment, yet here they all are demanding a daily horoscope. The cathedral, started in 1107, then fiddled with for the next five centuries, is one of those hotchpotches of styles and materials that ought to be a mess, but which through a magic glue peculiar to Italy hangs together perfectly. Covered in pink Verona marble, the facade dances through the ages as it passes through a band of superb medieval sculpture, then a gothic rose window, then a row of wonky Renaissance saints, before culminating in a cheeky classical pediment. A gift from Greece! Inside, the huge spaces are covered with an unusual number of frescoes. The guidebook boasts, a tad optimistically, of this being “the Sistine Chapel of northern Italy”, and there is certainly a lot to look at. Above the altar, Boccaccio Boccaccino’s Christ in Judgment looks down at us from his golden throne and decides whether we have been good or bad. Ouch. At the other end of the church, above the exit door, a giant Golgotha by the underrated Pordenone hammers nails of guilt into us with a ferociously crucified Christ. Ouch, ouch, ouch. It’s powerful stuff, and the fact that it sits behind such a beguiling pink facade makes it feel like a clever trap. On the other hand, Cremona clearly loves beauty for the sake of it, as the city’s intense relationship with music keeps making evident. It wasn’t only Stradivari who came from here. So too did Monteverdi, the first giant of opera. 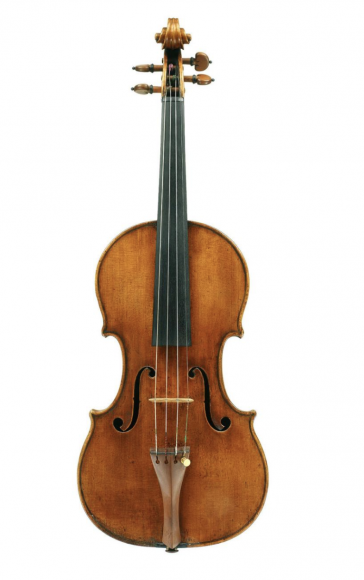 And, although Strad is the most famous of all violin makers, his fellow Cremonese magicians, the Amati, the Guarneri, were cut from the same exquisite maple. Most streets near the cathedral still seem to have a luthier at work in them, busily fashioning new instruments in the old ways. None of them seemed to mind me popping in to pester them and watch how it is done. As for why Strad was the best, that would be the wood he used, they tell me. Get a luthier talking about wood and they will continue at greater length than a Monteverdi vesper. So that’s fun. But the most intense musical joy to be had in Cremona is a visit to the city’s unique Violin Museum. Here, you can stroll among surviving Strads whose fiscal value starts in the low millions, but whose musical worth is priceless. And it’s not just violins. Strad also made guitars and cellos. They are all here. And a specially constructed echo space allows you to sit inside and experience the full detail of the Strad sound. This year, by the way, Cremona is hosting the world championships of musical-instrument-making — the 15th International Stradivarius Triennale — in which instrument makers from around the world compete to find the best. It’s on from September 7 to October 14, and will feature lots of playing as well as lots of making. For hotels, you could risk doing what I did and drive as near to the centre as you can, where I found the excellent and traditional Hotel Impero, halfway between the cathedral and the Violin Museum. “Fate will find a way,” Virgil said encouragingly. For food, wander round the back of the cathedral. The smell of mustard drew me into the Taverna la Botte, where the pumpkin tortelli was excellent and where they serve the much-trumpeted local speciality — cheese in a fruity mustard sauce. Delicious. It’s enough to make you hum a Monteverdi madrigal.